The text user interface appears. Any invalid command prints a usage message. To navigate, use the arrow keys or press Tab to step forwards and press Shift+Tab to step back through the options. Press Enter to select an option. The Space bar toggles the status of a check box. See Section 3.2, “Configuring IP Networking with nmtui” for information on installing nmtui. The NetworkManager text user interface tool nmtui can be used to query and set the static host name in the /etc/hostname file. 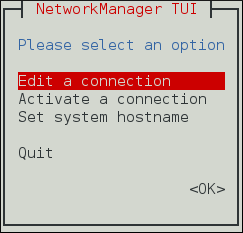 In Red Hat Enterprise Linux, NetworkManager uses the systemd-hostnamed service to read and write the static host name, which is stored in the /etc/hostname file. Due to this, manual modifications done to the /etc/hostname file are no longer picked up automatically by NetworkManager; you should change the system host name through the hostnamectl utility. Also, the use of the HOSTNAME variable in the /etc/sysconfig/network file is now deprecated.